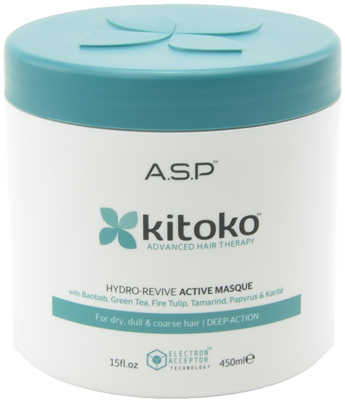 Hydro-Revive Active Masque blends specific natural African plant extracts with the unique Electron Acceptor Technology. This indulgent, deep-action, hydrating treatment has been created to revive dry, dull, or coarse hair. Baobab, Green Tea, Fire Tulip, Tamarind, Papyrus, Karite, Vitamins A, E, NMF combine to quench and smooth moisture-thirsty hair, leaving it de-tangled, supple, controllable, and beautifully radiant. Color-safe formula.